Which Scaffold Shrink Wrap Company Is Best For My Project? Which is the best scaffold shrink wrap company depends very much on the type of scaffolding project and where the work is to take place. Since Rhino Shrink Wrap is a company which prides itself on a transparent approach to business, and never wishing to shy away from talking about the competition, some of the well established shrink wrap companies in the UK are listed at the bottom of this page. First, here are a few questions you might ask to help get the right ‘fit’ for your next project. WHERE ARE YOUR SHRINK WRAP INSTALLATION TEAMS BASED? The location of the scaffold shrink wrap contractor is also important if any issues develop with the shrink wrap sheeting that need a return visit. Shrink wrap companies that are centrally located or located near to the site can return much faster to fix shrink wrap problems. Just a final thought on the location of a shrink wrap company; It has been known for some scaffold shrink wrap installers to list their ‘London office’ or ‘Glasgow office’ on their website which looks great until you discover in all reality they just have a local phone number. If finding a local scaffold shrink wrap company is important you, it is always worth doing a little ‘digging’ to test the validity of these claims. HOW DO YOU ENSURE THAT YOUR INSTALLERS ARE COMPETENT? All scaffold shrink wrap installers should hold a general CSCS card that proves they have reached a basic standard of health & safety awareness, and additional cards such as IPAF for the use of MEWPS are also common. However, there is no nationally accredited dedicated ‘card scheme’ for the installation of shrink wrap sheeting. This means you must get proof that the company you are using has a proper induction scheme for new staff and written proof that each team member has been assessed as competent in all the elements of shrink wrap sheeting. Ask for the records. WHAT FLAME RETARDANT CERTIFICATION CAN YOU PROVIDE? Shrink wrap for scaffolding must be flame retardant. In the UK there are two key ‘standards’ to be aware of – the basic European standard test (EN13501) which is referenced by building regulations and the much more extensive LPS1207 and LPS1215 standards which are managed by the BRE. The main difference between the LPS1207 / LPS1215 and EN13501 is that whilst EN13501 is a one off ‘test’, the LPS is a ‘scheme’ whereby the quality and flame retardant performance of a shrink wrap film is independently tested and verified by a third party company each year. Whichever film you are using, if the film is flame retardant, it should be clearly printed on the shrink film and you should obtain a recent flame retardant certification for the film and check it’s validity. ARE YOU A SPECIALIST SHRINK WRAPPING COMPANY? Many scaffolders offer shrink wrapping to their clients as part of a range of services. The benefits of using a scaffolding company to provide a shrink wrap service is that they are normally located close to their clients and if they are experienced scaffold shrink wrappers there is a good chance that they will set up the scaffolding in the best way possible (nice and flush structure for example) which should result in a great looking job. Specialist companies exclusively provide shrink wrap installation services. These teams will be carrying out shrink wrap installation work every day which should lead to genuine mastery, however, as mentioned, if they are travelling long distances then costs may be higher. Question your shrink wrap company shortlist on points 1-4 above and you will certainly maximise your chance of contracting a professional shrink wrap company to carry out the work. However, as everyone involved in construction knows, sometimes things go wrong and unfortunately the reaction of your shrink wrap company to problems can be difficult to test in advance. Find out if they have a telephone that is answered by a human being outside of office hours? Do they have a senior management team who are ‘close to the action’ and understand construction problems? A problem with the shrink wrap sheeting impacts our reputation, the scaffolders reputation and the contractors reputation. At Rhino Shrink Wrap we have found from experience that the best way to deal with a problem is ‘head on’. Very often that means a supervisor or member of the management team getting out on to site to meet everyone involved and working out a resolution. For a more minor problem it certainly means a senior manager always being available on the telephone to talk to a customer. WHAT SUPPORTING INFORMATION CAN YOU PROVIDE? A scaffold shrink wrap company should be able to provide you with a range of information to start the project. As a minimum this should include a guide to setting up the scaffolding structure and details of how is this sheeting will be tied to your scaffolding structure. This will ensure that any wind loading requirements are accommodated in the design of your encapsulation?’ A fundamental question often overlooked. It is surprising how many shrink wrap companies cannot even provide basic information on the wind loadings that their product can support. Envirowrap – located in Tenterden in Kent have been around for years, and were one of the first scaffold shrink wrap companies in the UK. From their base in Southern England they focus on providing a scaffold shrink wrap ‘supply & fix’ service of their Envirowrap sheeting. Envirowrap scaffold sheeting is approved flame retardant to EN13501. EcoWrap – Based on the South Coast of England, EcoWrap offer both a scaffolding and shrink wrap installation service. We here some good things about their shrink wrap installation team and the quality of their jobs. EcoWrap scaffold sheeting is approved flame retardant to EN13501 AND LPS1207 & LPS1215. 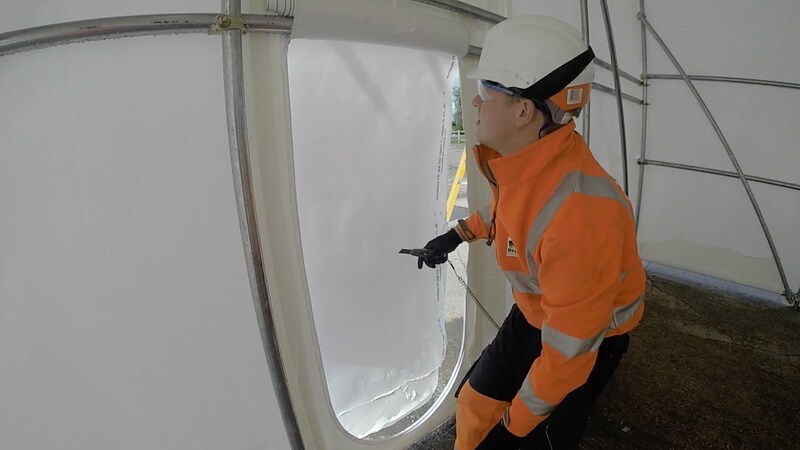 Wrap-It – Wrapit, based in Tipton, is part of the Hastings Group and provides a unique Heat Shrink / Shrink Wrap / Weatherproof Encapsulation / Dustproofing / Temporary Boat Protection / Temporary Spray Booths and Scaffolding Shrink Wrapping service to principle contractors, local authorities and private individuals throughout the UK. Uniquely, Wrap-It offer an ‘all in one service’ where they can produce a scaffold design, source a scaffolding contractor, and then supply and install the scaffold shrink wrap sheeting. Tufcoat – Based in Plymouth in the South West of the UK. Tufcoat provide a shrink wrap installation service and they also supply shrink wrap materials for boat shrink wrapping and industrial packaging applications. Their scaffold shrink wrap is approved flame retardant to EN13501. McDonald Scaffolding – Based in Scotland. We’ve heard good stuff from these guys and the quality of the materials they use. They have a specialist shrinkwrap and containment division which provides a high-tech, durable encapsulation solutions for a wide variety of markets. focus shrink wrap containment and weather protection in the oil, gas and marine industry, including offshore and shipyards. They also provide the service to the civils industry, including bridges and public buildings. Alltask Scaffolding – Based in Rochester, Kent. Shrink wrap has several potential uses including. They recommend shrink wrap for temporary roofs & canopies, containment / encapsulation for grit blasting & painting, asbestos works, demolition work and environmental works.